2016 PANINI SPECTRA & Infinity DEVONTAE BOOKER 3CLR RC REF PATCH AUTO #070/199. 2016 PANINI SPECTRA & Infinity DEVONTAE BOOKER 3CLR RC REF PATCH AUTO #070/199 Spectra #122/288. This card is gorgeous! It would be an ideal candidate to send in for grading. This card currently IS NOT graded nor am I any type of grading expert. 2016 Phoenix Devontae Booker RC SSP #'d 2/10 Patch 2-Color Denver Broncos Utah. Please see pictures. Thanks! 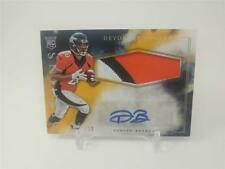 DEVONTAE BOOKER #741/999. FOOTBALL CARD 2016 PANINI CLEAR VISION OF ROOKIE. Near Mint - Mint (NrMt-Mint) -Must have 60/40 or better centering, smooth edges, original color borders and gloss. One of the following very minor flaws is allowed; a slight touch of wear on one corner, barely noticeable print spots, color or focus imperfections. DEVONTAE BOOKER. 2016 Panini Contenders Football. Rookie Ticket Jersey Relic Card. 2016 Prestige Devontae Booker Insert RC Lot: Recruits -- Broncos -. You’re purchasing aDevontae Booker Insert RC pair. The cards shown in images are the exact cards you will receive. 2016 Panini Prizm RC #252 Devontae Booker . 2016 Panini Prizm #134 Demaryius Thomas . The football cards shown in the images are the exact cards you will receive. Details on the Broncos cards can be found below and within the images. Adam Gotsis - Rookie Card - Defensive Tackle - Card #031. Devontae Booker - Rated Rookie - Running Back - Card #366. 2016 DonRuss - Denver Broncos - Trading Cards. AUTO DEVONTAE BOOKER 2016 PANINI JERSEY PLAYBOOK-BOOKLET-BOOK /199! Condition is Brand New. Shipped with USPS First Class Package. 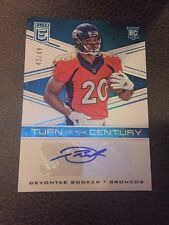 This is for a 2016 Panini CLASSICS ROOKIE # 300 Devontae Booker Rc. LOT # 1836. DEVONTAE BOOKER 2016 Panini National Treasures Rookie New Era Hats Off Auto #2/3. Condition is Like New. Shipped with USPS First Class Package. 2016 Devontae Booker Panini Prizm Draft Picks Purple Prizm Auto RC #D 11/99 HOT! 2016 Freshman Fabric #230 Devontae Booker Auto/#d 84/199. Card is EX or better in my opinion. You be the judge. This is for a super nice 2016 Panini INFINITY " ROOKIE MATERIAL JERSEY" # RM-DB DEVONTAE BOOKER Rc. VERY NICE JERSEY ! 2016 Panini Phoenix DEVONTAE BOOKER RPS Rookie Auto Jersey RC ORANGE #'d 11/99. Please see pictures. Thanks! THIS IS A 8 CARD LOT OF DEVONTAE BOOKER WITH 3 NUMBERED CARDS. RATED ROOKIE PRESS PROOF 7/25. 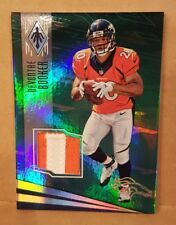 2016 Panini Prizm Devontae Booker Rookie Refractor #252 (Broncos) Hot!! Look!! This Devontae Booker card is out of 2016 Donruss Signatures Jersey Autograph. Card #289. This card is in Near Mint condition. #14 DEVONTAE BOOKER. 2016 PANINI NATIONAL TREASURES. DUAL UTAH LOGO PATCH AUTOGRAPH. Awesome card. Free combined shipping. #11 DEVONTAE BOOKER. 2016 PANINI THE NATIONAL CONVENTION VIP. 2 COLOR ROOKIE GLOVE RELIC CARD. DIAMOND AWE PARALLEL. 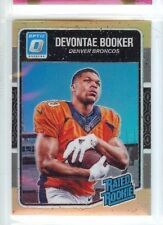 2016 Donruss DEVONTAE BOOKER #16 THE ROOKIES 715/999. DEVONTAE BOOKER. 2016 PANINI ORIGINS. CARD #RJPA-DB. RC ROOKIE 3-CLR PATCH AUTO.